Porsche 618 Concept – Spanish designer Miguel Angel Bahri has designed this prototype of an electric engine propulsion with the help of Porsche. Ready for another particular concept? – Miguel Angel Bahri brings us from the hand of Porsche this new design: Porsche 618, which promotes an electric engine propulsion, and tries to engage the design lines Porsche to a two-wheeler for a project called “wheels project” For now, we have designed the initial 160hp model, as Miguel Angel Bahri is considering a model S and RS model. “This should be considered as the purely sculptural initial model, since I am developing the RS version” – comments Miguel Angel Bahri. Miguel Angel Bahri has been brief in his manifesto: to design a purely electric bike, that could exist within the limits of reality. And this is his answer: a futuristic approach, with an inspiration in the design of the iconic 911 turbo, 917, 918 and 919. He took the DNA design of these iconic cars and transplanted it into his motorcycle concept. Named the 618, it represents a basic two-wheel electric vehicle for the German automaker, sitting just below the 718 range. The batteries are located in the heart of the bike for stability and turning. For recharging, the luggage compartment and batteries are accessed through elegant mans style doors. Miguel Angel Bahri has designed a motorcycle that would fit into the category of medium-sized cruiser motorcycles, which would be of entry for all those who seek a balance between sports performance and softness and comfort, without losing the spirit of a brand like Porsche. If Porsche wanted to fight the Ducati Diavel, this could be their inspiration, but we are pretty sure that Porsche does not have two-wheeled ambitions at the moment. It has innumerable wireless applications to synchronize your smartphone, an interior compartment thanks to the fact that it has no gas tank, LED front lighting and a geometric structure inspired by the Bimota Tesi. 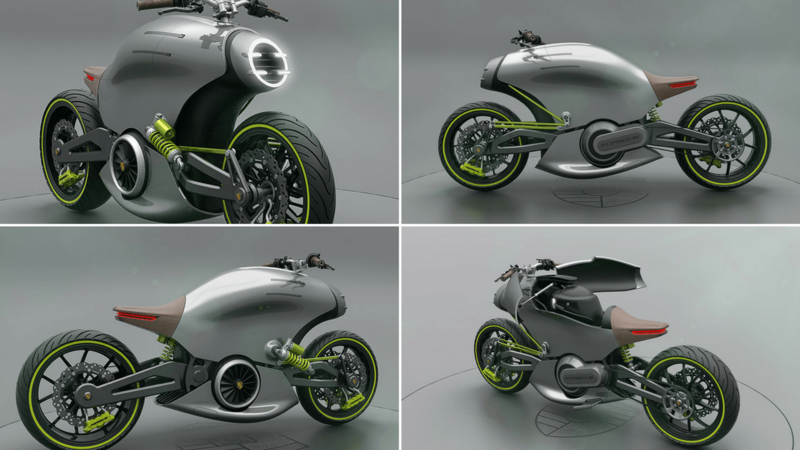 The sad part is that this is not an official concept of Porsche, although from now we are all fantasizing about this incredible motorcycle. What do you think?